CulturAgriCulturE: 87- What is a fruit? 87- What is a fruit? We consume fruit every day, it's one of our supply bases, we are highly recommended to eat five pieces per day. But in fact, what is it a fruit? To understand what a fruit is and what is the justification for its existence, you have to be placed in the perspective of the plant, not of the human being who wants to eat a dessert, or who wants to eat balanced. The plant, like all living beings, has a top priority in life, to reproduce, to ensure the sustainability of the species. In most cases, it makes it through the production of seeds. The usual meaning of the word includes most sweet plant products, which are often eaten as dessert. We find there apple, peach, cherry, mango, lychee, custard apple and many others. It also includes pineapple, pear and strawberry for example, which are not fruits (these are false fruits, infrutescences in the case of pineapple or fig, polyachene in the case of strawberry) or hazelnuts, almonds, walnuts, under the generic name of "dry fruits" which are not either. However we don't include eggplant, pepper, pumpkin or zucchini that are yet. I will focus today in the botanical sense of the word, so the role of the fruit from the viewpoint of the plant. The plant world does nothing by chance. If the fruit exists, there is a justification for its existence. Man consumes the fruit because he found it by chance during his research, at the time when he was still a hunter-gatherer, and he has since learned to domesticate it through agriculture. The fruit is the shell of the seed, whose shape, size, color and consistency vary. The fruit only exists for the seed. A simple proof: if pollination is poor, and the seed aborts, the little fruit drops before starting its development. The plant can't spend all the energy required to manufacture a fruit, if the seed can't be formed, at the risk of running out unnecessarily. The general structure is the same regardless of the fruit. These are the differences in appearance, texture, composition and proportion of each of these elements that determine the characteristics of each fruit. The pericarp is the wall of the fruit, coming from the processing, after the fecundation, of the wall of the ovary. For false fruit, it's the result of the transformation of the floral receptacle. - The mesocarp, which gives the juicy part of fleshy fruits. - The endocarp, sometimes lignified and called core." But the plant is facing a fundamental problem: it can't move. Yet it needs that its seeds are transported a bit or much further, something it can't do alone, except in special cases (as is the case of the squirting cucumber, ecballium elaterium, able to project its seeds to more than ten meters away https://www.youtube.com/watch?v=wOIHzl2h9a8 ). Why this need to send the seeds further? To avoid overcrowding in the same restricted zone and a food and survival problem. It therefore needs to disperse its seeds around, outside the influence of the mother plant canopy area. The plant kingdom has shown an amazing ability to imagine and implement varied and efficient systems to get there. Some plants use animals for transporting seeds. For this, the seed must be attractive, but protected. Others prefer to use air or water as a means of transport. The seed must be light and "equipped" to travel. So back to our plant, bearing fruit, often big and heavy, trying to disperse its seeds several meters off the mother plant. What is the solution? To use animals, that can move, which will pass in the surroundings. But for this it has to attract them. So we'll find a wide variety of colors, shapes, aromas, flavors, and even fruit size, to attract certain types of animals in particular. For example, all fruit whose seed is large (peach, apricot, mango, plum, etc. ), are seeking to attract mammals or large reptiles, which will be able to carry them. Fruits with small seed (apple, pear, citrus, tomatoes, cucurbits and other) may also attract birds and small rodents. But the fruit itself, the one we eat, carefully avoiding the core, what does it really do? It plays several roles, often successive, during its development. Throughout the cycle, it has a permanent protective role for the seed itself. For example, in case of frost or hail, the envelope will be damaged first. The seed only will be affected in the event of serious problem. At the beginning of the cycle, the seed in formation, still very small, is enveloped by the flesh, that protects from climate problems, and is usually unattractive, repulsive or even toxic to animals and insects, to prevent the fruit is eaten before the seed is viable. During this phase, if the plant is in a perilous situation in which its survival is threatened, it still has the possibility to offload (partially or totally) its fruits to try to survive. It "knows" that, as it is still on the beginning of the cycle, it has no chance to drive the seed to maturity. It is more prudent to offload to try to survive the problem, to be able to retry the following year. Then occurs the fruit set, a complex hormonal phenomenon that makes the fruit hangs permanently in the plant. There is practically no more possible physiological fall. The fruit grows, at the same time that the seed develops and grows. It can be used by the plant as a reserve of water and nutrients, in case it would be in a situation of risk (drought, flooding, pest attack), which would jeopardize its survival. This tank that the fruit is, allows the seed to complete its evolution, even if the plant eventually dies. In plants, as in wildlife, the priority is not the survival of the individual, but the perpetuation of the species. It is normal and usual that an individual is sacrificed for the survival of the group or the progeny. Once the evolution of the seed is complete, the plant will cause fruit ripening, accompanied by a change of its color and the production of attractive substances such as sugars and flavorings in order to attract the animals that the plant needs for seed dispersal. 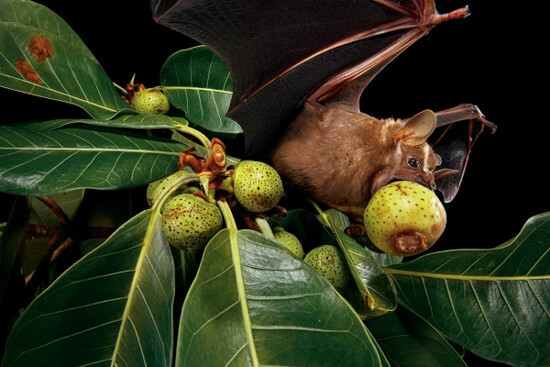 The animals will locate, then consume or take the fruit and reject the seed a little further, thus contributing to the dissemination of plant species. Size, color, type of meat, flavors are so many characters that will determine which animals will be attracted to each type of fruit. The local evolution of wild individuals will also add genetic variability within the same plant species. Plant breeders, those who create varieties by natural means (by controlled pollination, not by transgenesis), look for this genetic variability due to random crossings in nature, and local adaptation, in order to transmit interesting characters. For example, a wild fruit native to a very damp area will probably develop a tolerance or resistance to certain fungal or bacterial diseases favored by moisture. This character may be transmitted to its progeny. For the farmer, in the case of most fruits and vegetables, what matters most is the envelope, not the seed, which often is not consumed. But, except for special cases, no seed, no fruit. This is why it is important to understand that the objective of agriculture is to produce the fruit, while the plant aims to produce the seed contained in the fruit. Our interest in the fruit is not the same as the plant's one. The plant protects its seed through the fruit. The fruit is there to undergo all kinds of aggressions, weather, insect or disease. It is irrelevant as long as the seed is safe. But the farmer has to protect the plant against all external aggression, because his goal is to get a presentable, beautiful fruit, to be able to sell it. It must protect the protector. He must be able to produce the fruit, even if the seed is not viable. This difference of purpose represents a challenge and one of the fundamental problems of agricultural production. 87- Una fruta, ¿qué es?